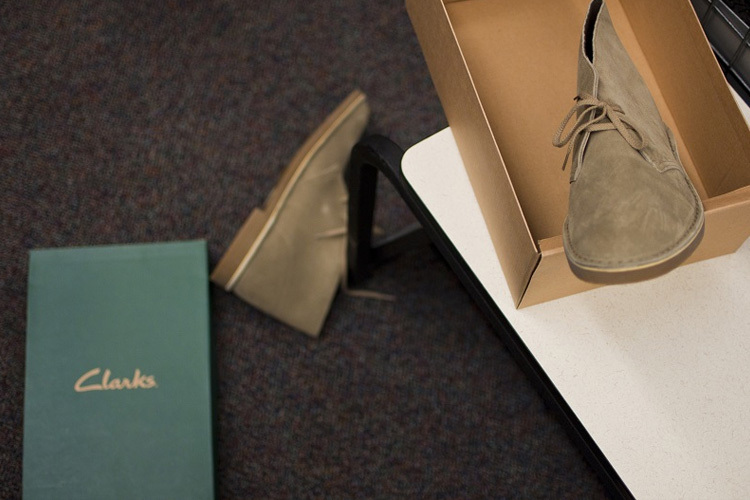 The Clarks Desert Boot is an instantly recognisable shoe that is widely regarded as a genuine casual classic. Many consider it the brand’s definitive design, and its story is one of the most fascinating in footwear history. Nathan Clark, great-grandson of co-founder James Clark, served in Burma during the Second World War. Before he went, his older brother Bancroft asked him to look out for interesting shoe designs and report back. It was supposedly while Nathan was on leave in Kashmir that the Desert Boot was conceptualised. He noticed many Eighth Army officers walking around in crepe-soled suede boots that went about as high as the ankle, and was told they had been acquired from a bazaar in Cairo. Nathan put together sketches of his version of the shoe and sent them back to the family base in Somerset. Bancroft seemingly did not share his younger brother’s enthusiasm for the design, as nothing was done with it until Nathan returned and put together prototypes himself. At the end of the decade the project finally paid off, when Clarks launched the design at the 1949 Chicago Shoe Fair. During the early 1960s the Desert Boot became fashionable on both sides of the Atlantic – supposedly because it was quintessentially British in appearance. On home soil it was a shoe-rack staple for members of the Mod subculture group, who wore it casually with Levi’s 501s and also formally with tailored suits, while in the US and France it was adopted by Beatniks and art students. More recently, many popular musicians have championed the shoe – from Britpop bands in the 1990s right through to modern acts such as Arctic Monkeys. Since it was first released, Clarks have sold a reported 10 million pairs of Desert Boots in countries all over the world. The understated aesthetic was what sparked its popularity at the beginning, and is undoubtedly what makes it a go-to shoe today, more than 60 years later. At Cuckoo Design we have the expertise to make sure your brand has a distinctive and original identity. We also put together ingenious marketing strategies that will ensure you reach your target audience and put out the right message. For more information on how we can help you transform your brand, feel free to give us a call on 0161 660 8352 or drop us an email at info@cuckoodesign.com.